In this age of vanity and excess, over consumption of food has fostered a swelling obesity epidemic, and equal but opposite backlash as people attempt to lose weight. New and trendy “diets” seem to pop up every day in every niche. There are gym diets, and carb diets, and no carb diets. Diets endorsed by celebrities and their personal trainers and nutritionists. The medical community has embraced specific dieting habits as awareness of food allergies and insensitivities and the horrors of gluten (gasp!) has become widespread. With all of this focus equally distributed between the classic ‘Get Slim, Quick’ fad diets and the more holisitic ‘Healthy Lifestyle’ dieting options, the major players in the game have been remiss in not addressing how these choices affect another part of our body. Our dental health can be impacted positively and negatively by our eating habits. This article aims to explore some of the positive and negative impacts that dieting trends can make on our teeth. The grapefruit diet: Slimming our waist, but eating our teeth? The ‘Hollywood Diet’ popularized in the 1930’s promotes eating grapefruit with every meal to decrease insulin production, boost metabolism and burn fat. This is one of many dieting fads that involves the use of citrus to shed weight quickly. A similar variation is the “lemon tea” diet, where hot water with lemon is served at each meal. The most serious consequence of this type of diet is erosion of tooth enamel, which protects teeth from wear and tear as well as bacterial growth and invasion. 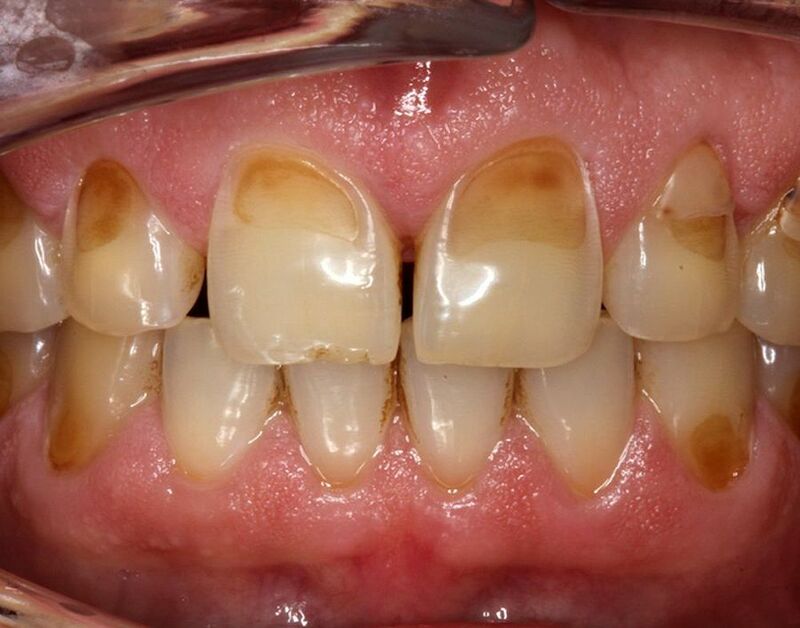 Worn down teeth and cavities can occur from a highly acidic diet. The “Apple Cider Vinegar” diet also poses a high threat to tooth enamel because of its high acidity. If you are using acidic foods in a weight loss program, one way to lessen the damage to your teeth is to rinse out your mouth with water after eating or drinking. Vegans, Celiacs, and Cavemen, oh my! Dieters who eliminate certain “commonplace” foods from their mealtime regiments face a different subset of pros and cons. Vegetable intake is great for the teeth and the body, supplying nutrients that ward against oral and other cancers, and chemicals like folic acid that aid in pregnancy, tissue health, and gum health. There are many diet supplements that are advertised either in infomercials, online stores, or just plain available over the counter. Even some prescription pills are used (appropriately, or inappropriately) for their weight loss properties. One of the potential consequences with serious impacts on oral health is the potential to experience bruxism, or tooth-grinding. Most stimulants have this as a potential side effect. However, many people only grind their teeth in their sleep, so they may not even be aware that the medication is causing this damage. Bruxism can lead to wearing down of enamel, cracking or chipping of teeth, and even jaw alignment issues. These diet pills should come include another disclaimer: May cause Adult Onset of Orthodontia!